UPDATE [23.05.2014]: This tutorial has been updated to work with recent versions of VWorkflows. In the last three parts of the tutorial VWorkflows did only handle one input/output per node. However, for many use cases it is necessary to handle multiple connectors per node (see Issue 3). This tutorial is shows lots of amazing features! Thanks for your motivating feedback! 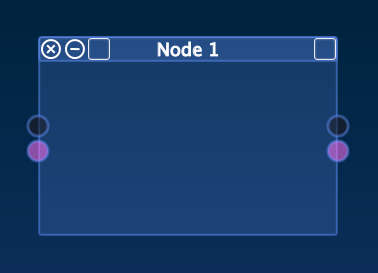 For those of you who have asked me about custom node content: I’m working on a tutorial. Stay tuned! & follow me on Twitter. The JavaFX based UI has been heavily improved. It makes use of the new multi-connector API (see below). 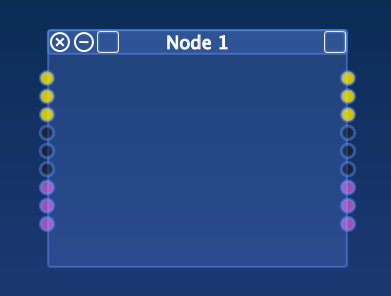 In addition each node can have one main input and output per type. This allows to directly connect two nodes without the need to explicitly specify the connectors. The UI can use this to resemble the previous connection behavior (before the multi in/out implementation). To compile from the command line just type ./gradlew build. Run it with ./gradlew run. Download VWorkflows and create your own flow visualization apps/controls. 8 Responses to "[Part 4] VWorkflows & Multiple Inputs/Outputs"
Very nice Work. I like it. But how you can chance the content with own content inside the node? For example with a XY Controll inside. This will be part of the next tutorial. In short: extend the factory. My fault. It should work now. I do want to combine my own windows. How do I connect them? which api should I look at? could you help me…is very urgent.. The tutorial shows how to create connections between nodes/windows. What exactly do you need?